The Deadly Silence Act will allow gunfire suppressors to be deregulated and be sold to the public without regard to the dangers posed by silencers. "Lifting the restrictions on sales, says Robert Spitzer, a political science professor at the State University of New York at Cortland and author of five books on gun policy, is really about boosting the fortunes of the gun industry. "The sound of gunfire, Spitzer says, is actually an important safety feature. Joggers running in the woods or pedestrians walking city streets should be able to hear gunshots clearly so they can avoid danger." The American Suppressor Association (ASA) claims they only want to protect the hearing of gun enthusiasts. 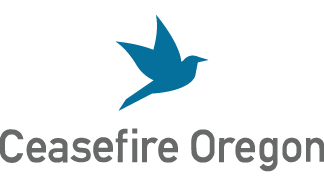 (Ceasefire Oregon suggests ear muffs which are inexpensive and effective.) The ASA professes to be concerned about the "tender ears of young shooters." Too bad they are not concerned about the tender bodies of young gunshot victims. The ASA cares about legal tender, not tender hearing. Read more about the dangers of silencers at Violence Policy Center. HR 367 makes money for the American Suppressor Association but Americans pay the cost with the lives of our loved ones. From “Trigger Effect,” S.T. Vanairsdale, SacTown Magazine, emphasis added. Find your legislator here, then CALL! Tell her/him to vote NO HR 367. We have a handy list of phone numbers for Oregon legislators below. Not in Oregon? Find your legislators here. Tell them to vote NO on HR 367.